Hip implants are artificial devices that form the essential parts of the hip joint for a hip replacement surgery. The hip implants vary by size, shape, and material. Implants are made of biocompatible materials that are accepted by the body without producing any rejection response. Implants can be made of metal alloys, ceramics, or plastics, and can be joined to the bone. The metals used include stainless steel, titanium, and cobalt chrome, whereas the plastic used is polyethylene. 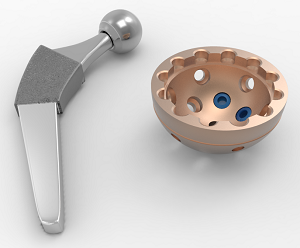 Various components of a hip implant may be used for hip replacement surgery. The components used may depend on the extent of damage to the hip joint, and the preference of the orthopedic surgeon performing the procedure. The hip joint is a ball-and-socket joint. The ball or the spherical head of the thighbone (femur) moves inside a cup shaped socket (acetabulum) of the pelvis. Ceramic-on-ceramic implant: The ball is replaced with a ceramic ball, and the socket has a ceramic lining. These wear less than metal-on-metal implants, and are the most durable among the available hip implants. Cementless Fixation: Cementless implants are coated with a porous material. They attach to the new bone that grows to the surface of the implant via bone ingrowth. The implant may be fixed using screws or pegs until bone ingrowth. Patients need to limit weight bearing and use crutches or a walker following cemented fixation to allow the bone to attach itself to the implant. Cementless fixation is an option for more active patients with good bone quality.